Asus Introduces its Windows 8 Touchscreen Ultrabook -- We Like! The new Asus VivoBook is a beautiful new Ultrabook with a touchscreen interface. Let’s review the details. 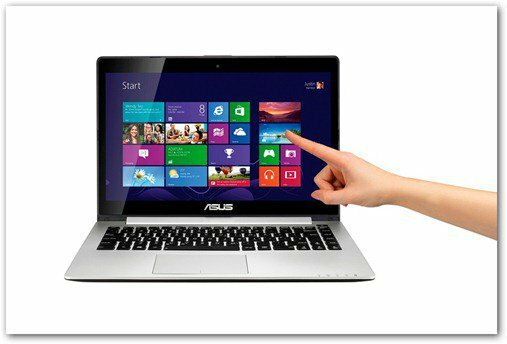 Windows 8 is here, and the first devices running the new operating system from Microsoft have arrived including the new ASUS VivoBook Ultrabooks. The new Asus devices announced appear to be the ideal Windows 8 scenario — Ultrabook or Macbook Air like notebook with a full keyboard, serious horse-power and a touchscreen which allows you fully leverage the new Windows 8 interface. There’s also the VivoTab RT, which is running the Windows 8 RT Edition however personally, I’m just not ready to lose my keyboard yet and if I was, I would probably just go with the Microsoft’s Surface and grab the keyboard/case combo just in case. So, coming back to the VivoBooks, there are two types of notebooks, the S200 and S400, with 11.6 and 14 inch displays (both at 1366 x 768 resolution). The first one has a core i3, ULV Pentium 987 or ULV Celeron CPU, up to 4 GB DDR3 at 1333 MHz and 320 and 500 GB hard drives. The S400 on the other hand, can be spec’d to include a core i3, i5 or i7 CPUs or the ULV Pentium 987 or ULV Celeron. The CPU is coupled with up to 8 GB DDR3 at 1600 MHz. In regards to video, the graphics card is fairly basic with an on-board card for all the various versions. So far, this is best Ultrabook I’ve seen yet for Windows 8. Lenovo is also working on a similar device (X1 Carbon with a touchscreen) however until then, Asus has done a nice job right out of the Window 8 gates! I would need to go hands-on with one before I could buy it to ensure the Trackpad was as good as the MB Air. For me, that makes all the difference in a Trackpad. Oh dear god. I know. I have an ASUS laptop and the trackpad is almost unusable. I always use an external mouse. Exactly. That’s why I use my MB Air so much at home. Surfing with its trackpad is amazing. Better than a mouse for me. I have an Asus one, too, and mine works quite well. Guess it depends on the model. Yeah you right. I had an ASUS EEE PC before I got my current ASUS laptop and I liked my trackpad on my netbook a lot.